Who here doesn’t enjoy a good backyard cookout? There’s just something about grilled food that we all know and love, but the flavor of the food will all depend on the type of grill you cook it on. While some prefer charcoal grills, you have others that prefer gas grills due to the ease of use. Of course, finding a good gas grill that is worthy may not be easy and for this reason, I am going to reach out to you and introduce you to the best 6 burner gas grills currently on the market. Mind you, I chose 6 burner grills because you know, bigger is better when it comes to grills! With 6 burners, you will be able to cook a whole lot of food. 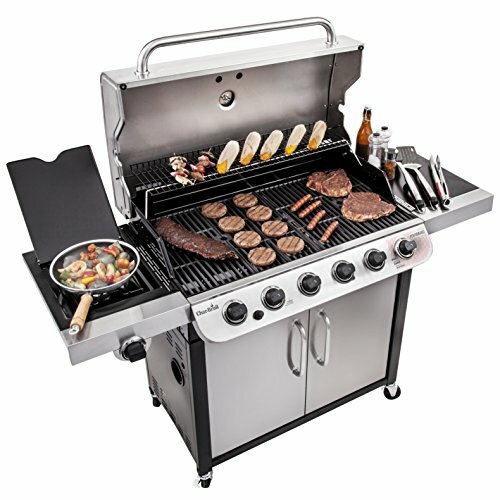 1 What is the Best 6 Burner Gas Grill? 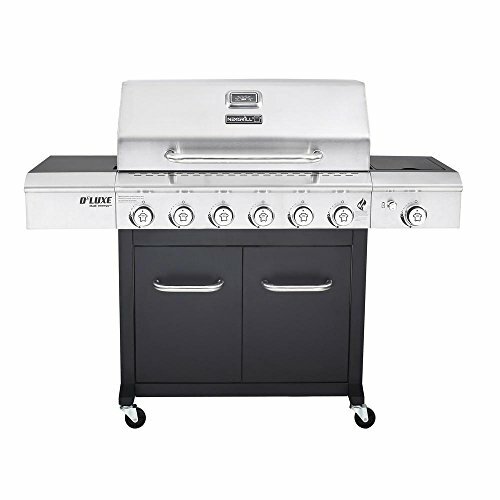 What is the Best 6 Burner Gas Grill? For those of you that plan on feeding a lot of people at a gathering, due to the fact that it has a total of 6 burners, this would be a great grill for you. That’s right, this grill has 6 main burners, as well as a nice stainless steel side burner, so you will have a whole lot of space with this one. Here we are, living in a world where bigger is better, so it’s natural to want the Nexgrill 6 burner gas grill. The Nexgrill gas grill has a round side burner that is made from porcelain and stainless steel coated materials. With the Even-Heat design, combined with the 768.5 square inches of cooking space, you will be able to cook some delicious food for the whole crowd. Electronic Ignition – With this feature, you won’t have to mess around with getting the grill started. This grill has an individual push-to-start ignition to use for each burner. Stainless Steel Side Burner – You will be able to work on the side dish, while you’re still cooking the main dish. Durable Cast Iron Matte Finish Cooking Grates – When you grill on the Nexgrill, you can rest with the satisfaction of knowing you’re cooking your food on quality grates. Durable cast iron greats offer high heat-retention and put off some amazing sear marks. Even-Heat System – The even-heat system is really cool. It offers angled flame tamers, so you know the heat will be distributed evenly across the food. This also helps prevent flare-ups and adds a smoky flavor to your food. Many have said that the unique feature on this grill is the side mounted sear burner. Instead of offering the common gas burner, this particular model offers a 15,000 BTU infrared unit that will help you sear a steak. However, even though this grill is big, it is recommended to only sear one steak at a time, but that isn’t that big of a deal. This grill takes the ceramic tile diffuser and uses it to convert the flame of the gas burner into infrared – this is a form of technology that has been around for quite some time. All in all, the Nexgrill gas grill appears to be a grill with some interesting “must have” features and I honestly believe it deserves its spot on this list of the best 6 burner gas grills. Another good 6 burner gas grill that really stands out from the crowd comes to us from Char-Broil. The Char-Broil Performance 650 is a nice 6-burner gas grill that is capable of delivering 60,000 BTU’s of heat across its 650 square inch cooking surface. The primary cooking surface is 18.5 inches deep and 35 inches wide. It features porcelain-coated iron gates that are said to prevent food from sticking to them, which makes it easy to clean when you’re done. Two Metal Side Shelves – With the two metal side shelves, this means you will have more space to work with. Double-Door Storage – I always like when a grill offers its own storage cabinet. The storage area is convenient because you can store your tools and accessories. It also offers easy access to the propane tank. Sitting on Four Casters – Two of the casters lock, so you don’t have to worry about the grill moving when you don’t want it to. Power – The earlier version didn’t calculate the amount of power needed to cover the cooking space correctly. They gave 36,000 BTUs of power per hour, and in all actuality, 47,000 BTUs of power was needed. With this grill, the Performance 650, they got the power to size ratio almost on key. You get a total of 60,000 BTUs across the 6 burners, which covers a total of 650 square inches – this is close to perfect as it should be 100 BTUs per square inch. This grill has enough power to spread the heat evenly across the surface, which makes for food that has been evenly cooked. Side Burner – In this day and age, the side burner is something that many people look for in a grill. Side burners come in handy for cooking sauces, and additional sides you plan on having with your meal. This particular grill offers a side burner than puts off 10,000 BTUS an hour of power, so you could even cook some vegetables and even pasta. Grates – These are cast iron grates and if you’re familiar with cooking on cast iron, you already know this is a good thing. These greats have just the right thickness to them so that they can retain heat and spread it rapidly across the cooking surface. This puts off a nice even heat so you could sear steaks. Plus, as an added bonus, cast iron grates make it easier to clean up because food isn’t going to stick to them. Easy to Clean – Speaking in cleaning the grill, you don’t have to worry about making a mess, because it is easy to clean. Everything on the grill is porcelain-enameled, so debris and dirt will quickly fall off. All you have to do is take a damp rag and scrub it lightly to clean it. It is recommended that you clean your grill at least one time a month. Electric Ignition – An electric ignition on a grill is always a bonus because you don’t have to hassle with trying to light the grill. The Char-Broil gas burner grill is a nice grill to have. This grill is capable of cooking food quickly and evenly on its big cooking surface. Char-Broil offers just the right amount of power for their 650 Square Inch surface. Plus, you cannot forget about those cast iron grates that can really get the job done. Then, there’s the easy to clean surface. 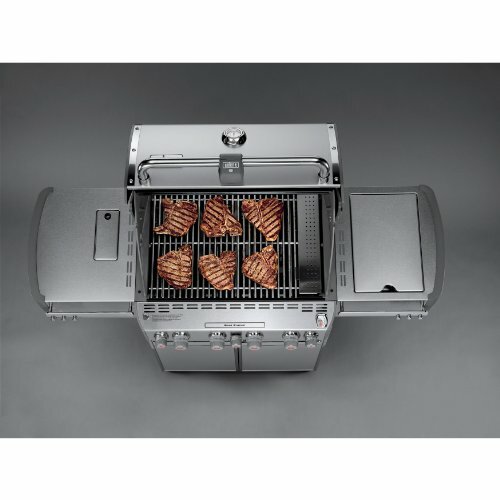 This is one of the best grills of this size at an affordable price currently on the market. The Weber Summit Gas Grill is another grill that deserves its spot on the list of the best 6 burner gas grills. This one just so happens to be fully loaded with almost everything you can think of. It has 6 main burners, along with a side burner, a dedicated sear burner, an infrared rotisserie burner and a smoker box that just so happens to have its very own smoker burner. So if you count them, it actually has a total of 10 burners on it and 10 control knobs to go along with them (the control knobs are lighted). Long story short, this is the ultimate grill coming to us from Weber. Cooking Grates – The cooking grates come in three top notch materials. You have stainless steel, porcelain-enameled steel, and porcelain-enameled cast-iron. For those of you that are familiar with these materials, you already know that this is good news. Each type of material is capable of retaining heat evenly and can sear steaks wonderfully. The porcelain-enameled steel cooking grates will be easy to clean and they are durable. The stainless steel rod cooking grates will leave those beautiful sear marks on the steaks that we all know and love, and they can hold heat like never before. Porcelain-enameled cast iron cooking grates are easy to clean and they don’t need to be seasoned. Flavorizer Bars – The flavorizer bar system was originally created by Weber, so it’d only make sense to find it on this grill. The flavorizer bars are angled just right, making it so that the food gets the perfect touch of flavor. The drippings that are vaporized by the flavorizer bars will go down the slope where they are funneled away from the burner tubes, straight into the grease management system. This is a technique that will protect your burner tubes from getting clogged and will also prevent flare-ups. The flavorizer bars are long lasting and easy to care for. I recommend brushing them with a stainless steel grill brush at least once a month in order to keep them working at their best. Burner Tubes – The burner tubes on this grill are made of stainless steel with no welds (it’s a single piece). Since it’s a single piece, they are stronger and more resistant to rust. Also, since they’re protected from grease drippings, they can easily be cleaned. Burner Controls – Each burner has its own individual controls, so you can follow the indirect or direct method when you are grilling. The burners are spaced, so the heat spreads across the cooking grate. Fuel Gage – We all want to know when we’re on low fuel, right? For this reason, the fuel gauge on a grill comes in handy. The Weber has a fuel gauge, so you will know when you’re getting low. Grease Management – As I previously stated, when the juices drip off of the food, it runs down into the Flavorizer bars, then what doesn’t vaporize into smoke will go to the grease management system. Basically, the grease management system is an angled grease tray and catch pan. The grease tray can be found under the cook box. Grease that goes down to the grease tray will go into the catch pan. Don’t worry, because the catch pan and grease tray are easy to clean. You can take the tray out of the cabinet so that you can clean it and when the pan starts to fill up, you can toss the disposable drip pan away and replace it with a clean one. All in all, if you’re searching for a good grill and have a little bit of extra money to spare, I would highly recommend the Weber Summit S-670. This is the ultimate grill that may have a high price tag on it, but it comes equipped with the best features you’re going to find in a grill. With the Weber Summit Gas Grill, people are really going to look up to you. At your next backyard party, imagine all of the delicious food you could grill for the crowd. This grill is capable of taking care of everything from delicious chicken on the rotisserie to burgers on the grate – it can even add a delicate touch of smoky flavor to any dish. The Weber Summit Gas Grill will take your backyard BBQ to an entire new level. While the Weber Summit S-670 may not be in everyone’s budget, it is well worth every penny. However, I understand if you can’t fork out a couple thousand for a grill. If you’re only looking to spend between $300-$400 on a grill, then I would recommend either the Nexgrill or the Char-Broil Performance grill.